Both Maddie and her grandfather, Pius the Pond, share a special bond with an old horse called Shekinah. What Maddie, Pius, and Shekinah have in common is the shine in their eyes. When Shekinah dies, Pius helps Maddie overcome her grief by showing her that Shekinah remains with her in everything that shines. 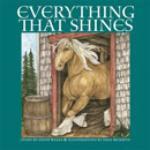 This picture book was published in Prince Edward Island, the home province of both the author and the illustrator of this story. Little Maddie and her family live on a farm on Red Banks Island. Maddie’s best friend is Shekinah, a large old horse. Her grandfather notices that Maddie and Shekinah have the same shine in their eyes, and watches as they grow closer and closer. When Shekinah dies, Maddie's grandfather helps her through her sadness by showing her that Shekinah is still a part of her life even though she cannot see him.